For his first two terms, Governor Andrew Cuomo’s position on legal pot has moved from outright opposition to support for a tight-fisted medical cannabis program. But now, heading into his third term, he’s openly embracing legal pot for adults. Cuomo outlined his agenda for the first 100 days of the 2019 legislative session, and after sounding off on tax issues, reproductive rights, gun control, education, and a goal for carbon neutral electricity by 2040, he got to pot. 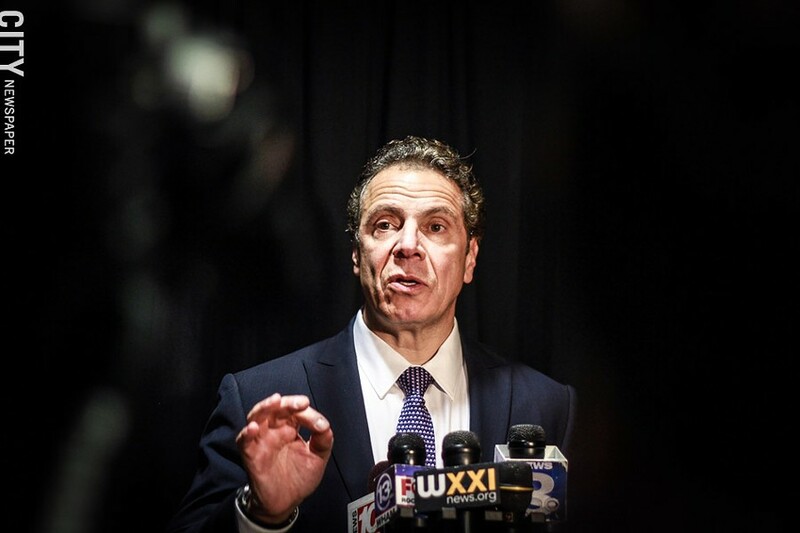 “We must also end the needless and unjust criminal convictions, and the debilitating criminal stigma, and let’s legalize the adult use of recreational marijuana once and for all,” Cuomo said. But legal cannabis advocates were cautious about the governor’s remarks. Steve VanDeWalle, director of development for Rochester NORML, said Cuomo didn’t really elaborate on his plan, so any legislative intricacies are unclear. For example, will the state base legalization on the medical cannabis system and just make it less restrictive, or “are we looking at something much more open, like a system much more like Colorado, with a craft-beer-coffeeshop model?” VanDeWalle said. And not everyone is happy with the idea of legal pot in New York. But the governor's late to the party. Legislators have already been discussing the details of marijuana legalization in New York, especially in the Assembly, which Democrats have controlled for a long time. Democrats will take over the Senate in January, putting them in control of the chamber for the first time in almost a decade. The leading proposal in the Assembly, and a likely starting point for legalization discussions, was introduced by member Crystal Peoples-Stokes of Buffalo, who on Monday was elected as the chamber’s new majority leader. And Peoples-Stokes’ proposal goes beyond simply making it legal for adults to buy, possess, and use marijuana. It also establishes programs meant to help communities hit hardest by many years of criminalized pot. A conference in Albany last week centered on the best way to craft legalization legislation. Kassandra Frederique, the New York state director at the Drug Policy Alliance, which sponsored the conference, said that if the state legalizes marijuana for adults older than 21 there must be an effort to right the wrongs created by its prohibition, which adversely affected African-American and Latinx communities. And this is what draws legalization advocates like Frederique, as well as lawmakers, to Peoples-Stokes’ bill. The legislation, which has a matching bill in the Senate, would direct 50 percent of any revenues raised from taxing legal marijuana sales to a Community Grant Reinvestment Fund. It would finance things such as job training, after-school activities, and re-entry programs for people coming out of prison. Twenty-five percent of the revenues raised would go to schools, under the bill’s provisions, and 25 percent would go to drug treatment programs to reduce opioid addiction. Peoples-Stokes spoke at the conference and said it’s “critical” that any final measure include the community grant fund. She said it could even cut down on the cost of government. She also said the costs of family services such as foster care and adoption, which are necessary when family members aren’t there to take care of children, could be less. Peoples-Stokes said she also wants to avoid what she called “mistakes” made in setting up and implementing the state’s limited medical marijuana program. She’s not alone. "I don't think it should be set up the way we set up the medical marijuana distribution approach, because that is very limiting, and it only allows a handful of companies to participate in this new industry,” Assembly member Harry Bronson said during an interview Monday. He also wants legalization legislation to provide for the state to expunge "minor offenses of marijuana use and possession." Otherwise, Bronson likes the Peoples-Stokes bill and its approach. It addresses things he wants to see such as the designation of funding for educational purposes and substance abuse programs. And he believes the Community Grant Reinvestment Fund is crucial. As for how legalization advances, that’s not clear. Cuomo didn’t address that during his remarks Monday, though his address dealt with his agenda for the first 100 days of the legislative session, which implies he plans to move quick. One of the governor’s greatest legislative tools is the budget. Bronson said he's not sure if the Cuomo will put legalization language in his budget, but he wouldn't be surprised if the governor took that approach. This article has been updated with a correction regarding Cuomo's term.